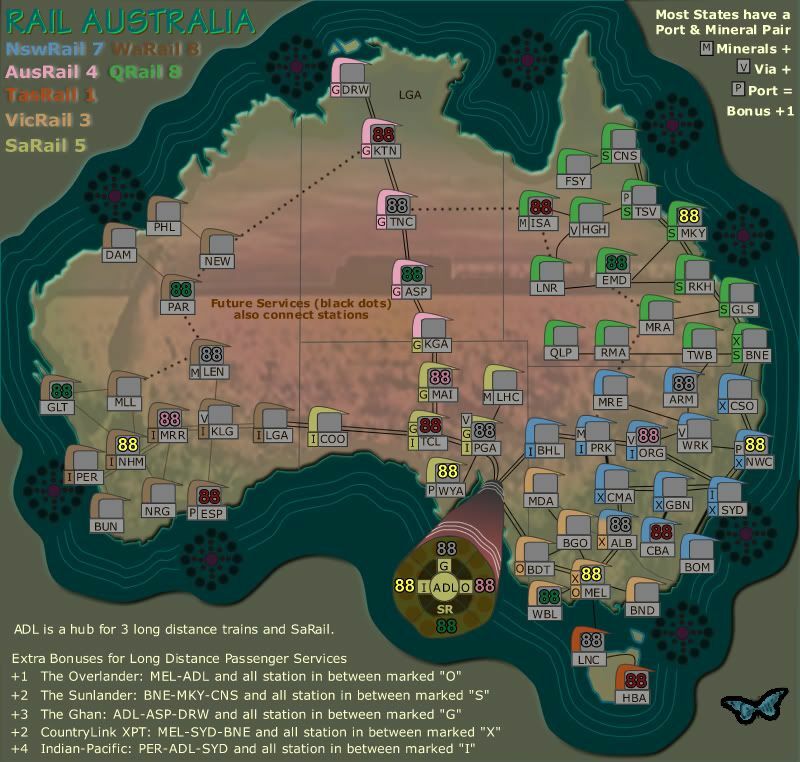 Re: RAIL AUSTRALIA V12 (p9) [I] - Starting Again! cairns whats happening with this puppy? gimil wrote: cairns whats happening with this puppy? Gimil, i was going to start it again, but ran out of creativity...and time. So for now it will fall to the dungeons for Vacation until such time as i resurrect it again. Wow, I reckon it's pretty good. But please continue, I want people to do more maps of Australia! I mean, it's going good. I reckon you should make it a little less complex for idiots like me though. Edit: Seriously, c'mon! Vacations are for... People, well please continue! Merker wrote: Wow, I reckon it's pretty good. Of course i included Bunbury. It will continue but not at this time, later. moving on over to the vacation forum! Let me know when you want it moved back cairns! gimil wrote: moving on over to the vacation forum! Let me know when you want it moved back cairns! I'd like this moved back to the main Forum thanks Gimil. It is in no longer on vacation. This is where the station designs are heading....back to the similar curved roofs that existed before. This keeps the curvy nature of the design as opposed to the rectangle/squarish design from V12. wait... i thought you were going without the central hub??? good to know... i suppose i should take the time to read cairns' posts properly instead of just looking at the pictures. yeti_c wrote: I think the sides of the map are too close - a bit cramped - could you grow the image - but keep the map the same size to give it a bit of breathing space on either side? For you C...mosts things are possible...Hehehe! Just to remind you of this post Cairns!!! I hope your vacation was restfull. I'm glad to see this map back in the forge. Can't wait to play it. Keep up the good work. trk1994 wrote: I hope your vacation was restfull. I'm glad to see this map back in the forge. Can't wait to play it. Keep up the good work. 1. Old legend station removed and replaced with train images for long distance trains. 2. ADL hub changed colour and still to be done is the didgerido makrings. 3. Mineral port pairs simplified in legend. 4. 30 PX added to overall map. Possible to be changed - I might look at placing a back ground on those legend pieces with curvy border as long as it doesn't go overboard and interfere with the overall desing artwork. i just took a real close look at this big one, and i just realized that there are some stations with 2 different colors, i'm assuming you have to hold those to get the bonus. Cairns, I'm going to brutally honest. Compared to all your other recent quenches (including Rail Europe), this looks light years behind graphically. The color palette is drab, the clarity extant in other Rail maps isn't there, and the bonus descriptions are both really long and inelegant (long-distance routes) or cramped into a corner (normal bonuses). Give it the Cairnswk touch, as right now it doesn't look like there is one. those were originally in early version meant to be like boomerangs. Australia does not have the distinct old European charm of the larger city stations except in the cities. The remote stations are more like flat tin roofs, and now larger stations like here in Cairns are nothing more than a couple of railways lines running through underneath a large shopping centre. So if these designs offend anyone ro they think they are "just Tad" then they're a little more conceptual than real life stations here in Oz. of course, this is probably far from finished, howver as to the design, i am kind of liking it very much now. TaCktiX wrote: Cairns, I'm going to brutally honest. Compared to all your other recent quenches (including Rail Europe), this looks light years behind graphically. The color palette is drab, the clarity extant in other Rail maps isn't there, and the bonus descriptions are both really long and inelegant (long-distance routes) or cramped into a corner (normal bonuses). Give it the Cairnswk touch, as right now it doesn't look like there is one. Hold your horses and be patient please. Small steps. whitestazn88 wrote: i just took a real close look at this big one, and i just realized that there are some stations with 2 different colors, i'm assuming you have to hold those to get the bonus. 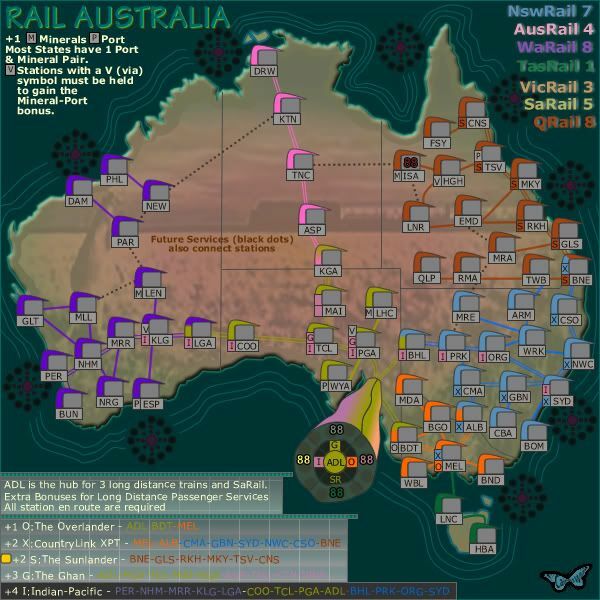 Re: RAIL AUSTRALIA V15 (p12) [I] - Legend! 1. 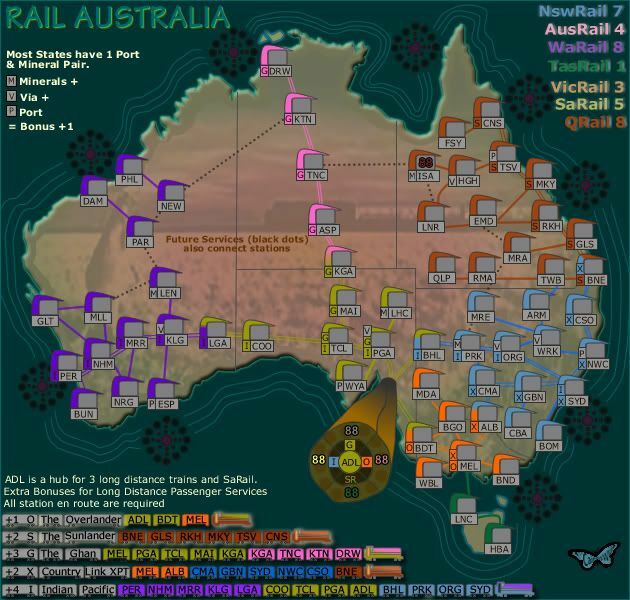 Trains removed and those long distance train explanation simplified. 2. some swapping around in the legend.